“Flourish. Banner. Frame.” by noted illustrative designer Von Glitschka is published by HOW Books as a primer for how designers can incorporate vector ornament throughout their work. We were asked to create an illustration for the book using a specific “perennial” ornament. 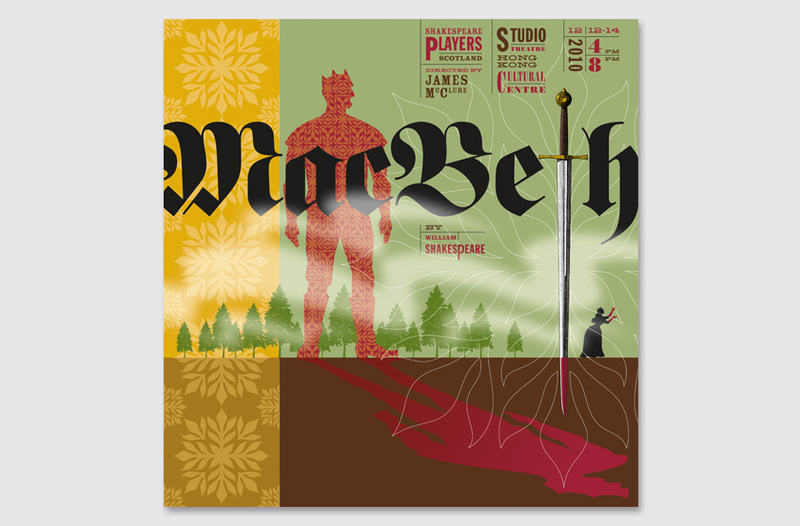 Our solution embodies the timeless and eternal themes of ambition and power central to Shakespeare’s MacBeth. In the image, MacBeth’s ambition compels him to spill the blood of rival royal heirs and doom his own fate, symbolized by the blood red shadow he casts. Burnham Wood lurks in the background, while the fog creates a metaphor for MacBeth’s muddled and conflicted state of mind. Lady MacBeth agonizes over her actions in the iconic hand-washing scene.